KEW ENGG. & MFG. PVT. 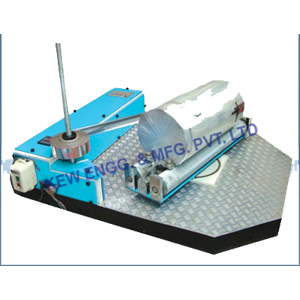 LTD. is a leading manufacturer, exporter, and supplier of mini roll wrapping machine from India. It has been specially built for robust and easy to operate features with high-quality equipment. Also, engineered for hard work in rugged environments with low maintenance requirements. It has been specially designed for packing products like Retread Rubber, Paper rolls, foils, film roll and many more. Mini roll stretch wrapping machine with speed of 0-12rmp and featuring with Weight: 400kgs and automatically system can wrap different size.